The Georgia Trust is marketing the Foster-Thomason-Miller House in partnership with the Madison-Morgan Conservancy. The property is listed by Lewis and Redwine Real Estate Group for sale to a conservation buyer who will agree to rehabilitate the building to certain standards. Serious inquiries should be directed to Michael Redwine or Jeffrey Hagy at mredwine@lewisandredwine.com or 404-394-4071 or www.lewisandredwine.com. Built in 1883 as “the most elegant country home in Middle Georgia,” and completely restored in 1986 (receiving the 1986 Georgia Trust State Preservation Award), the 5,000 square foot home includes five bedrooms, two bathrooms, parlor, library, dining room, and a spectacular central hall. This extraordinary home of national significance is an excellent example of the American Aesthetic Movement with elements of Queen Anne, Italianate, and Gothic Revival styles. A treasure trove of detail, the interior decorative elements include extensive wood carving, cabinetry, plasterwork caryatids, and numerous motifs and symbols of the Aesthetic Movement. The ideal location of the house makes for a short walk to the Cultural Center and Madison’s Downtown shops and restaurants. In 2001, the rear kitchen addition burned. The main building suffered primarily smoke and water damage. In 2018, it was added to The Georgia Trust’s Places in Peril list. The property will require significant investment to rehabilitate and presents a unique opportunity to design and build a new rear addition with modern amenities. The house sits on 1.024 acres and there is also an adjacent .86-acre developable lot available for sale. 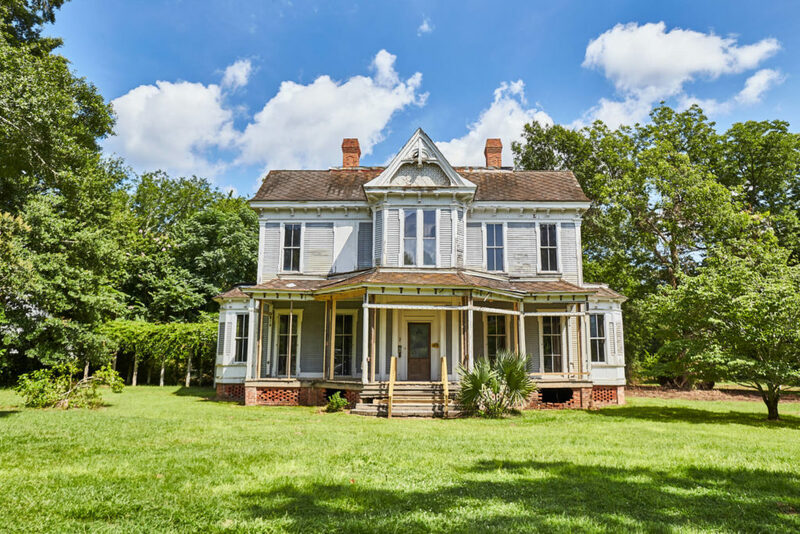 The property is listed on the National Register of Historic Places, making it eligible for significant economic/tax incentives, including Federal Rehabilitation Tax Credits, State Rehabilitation Tax Credits, and a Preferential Property Tax Freeze. The property is also regulated by Madison’s local historic district.